I wouldn't buy that car!...It comes with too many strings attached. Proof that old Model T parts can be found hanging around everywhere. Now that's what I call an exploded view! Neat, but why are the rims & tires inside the wheels? I think someone got the assembly order wrong! I don't know exactly where that museum is located, but if it were here in California that display would work like a wind chime in an earthquake. 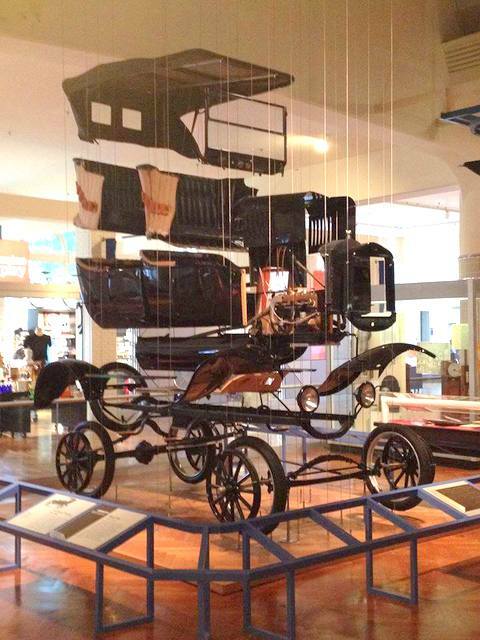 I think it's in The Henry Ford Museum in Dearborn, Michigan. A note, for the T folks that's never been to the Henry Ford museum if you ever find anyway possible to make the trip to see and visit this site you'll not be disappointed. We were lucky enough to get to go for the 100th anniversary. I spent 2 days inside the museum several hours each visit, then on my last day of our vacation I figured out that Greenfield Village was recreated right behind the museum...! Trust me you can spend a week in that area an not see everything. My folks took me there in 1964 on the way to the World's Fair in New York. The wonderful cars that were there are still etched in my mind. We were there this last October. All I can say is, wow what a place! Watch for "Innovation Nation" Saturday mornings on CBS. That shot showed up last Sat.